Most of us pay little attention to the rhythm of our beating hearts unless that rhythm abruptly changes for no apparent reason: rapid or irregular heartbeats, known as cardiac arrhythmia, can be very disquieting. The causes of arrhythmia are varied and the severity ranges from mild to severe. For these reasons, accurate diagnosis and treatment are important. Atrial fibrillation is by far the most common form of cardiac arrhythmia, affecting 2 – 3 million people in the United States every year. The risk of atrial fibrillation increases as we age. While it is infrequently diagnosed in people under forty years old, it occurs in up to half of the population who are more than eighty years old. What happens during atrial fibrillation (AF)? Our heartbeats are controlled by electrical impulses in the heart. These impulses begin by moving through the upper chambers (atria) of the heart. During AF, the atria quiver instead of beating effectively. 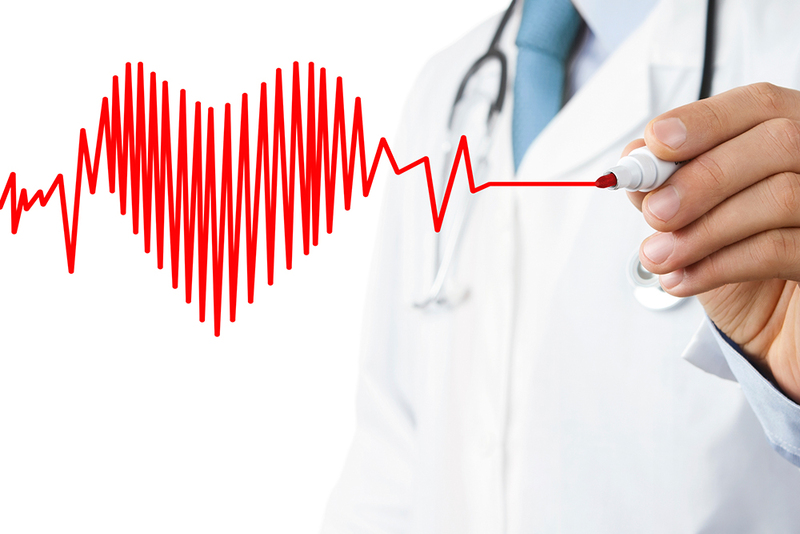 Why is it important to have atrial fibrillation diagnosed and treated? The risk of having a stroke is two to seven times higher in people with AF than that of the general population. When the heart is beating irregularly, the blood has time to stagnate. This can lead to the formation of a blood clot, which can then enter the circulation system and travel to the brain, causing an embolic stroke. Atrial fibrillation is usually accompanied by symptoms related to either the rapid heart rate or the formation of an embolism. A rapid and irregular heart rate may be perceived as palpitations or exercise intolerance. Occasionally AF produces symptoms of angina, and congestive symptoms including shortness of breath or edema (buildup of excess fluids). Sometimes the arrhythmia is first identified with the onset of a stroke, or with a TIA (transient ischemic attack). During a TIA, which is considered to be a warning sign of an impending stroke, a person experiences temporary loss of function in a part of the brain due to a reduced blood supply. It is not uncommon to diagnose atrial fibrillation during a routine physical examination or EKG; some people feel no symptoms of AF and are surprised to learn they have it. The presence of AF shows up on an EKG as diffuse irregularity with absence of the atrial waves. This common condition is linked to several cardiac causes but may occur in otherwise normal hearts. Known associations include: high blood pressure, valvular heart disease (mitral stenosis and mitral regurgitation), heart surgery, coronary artery disease (the buildup of plaque in the arteries), hypertrophic cardiomyopathy (thickening of the heart wall), excessive alcohol consumption, hyperthyroidism, lung diseases (pneumonia, cancer, pulmonary embolism), and intense emotional turmoil. The main goals of treatment are to prevent temporary circulatory instability and to prevent stroke. Heart rate and rhythm control are used to achieve circulatory stability, while anticoagulation may be required to decrease the risk of stroke. Rate control treatments seek to reduce the heart rate to normal — usually 60 to 100 beats per minute — and include beta-blockers, cardiac glycosides (e.g. digoxin), and calcium channel blockers. Rhythm control seeks to restore the normal heart rhythm, which is called the sinus rhythm. Rhythm control methods include electrical shock and the use of certain drugs to return the heart to its sinus rhythm. Studies suggest that rhythm control is mainly a concern in newly diagnosed AF, while rate control is more important in people with chronic AF. Rate control with anticoagulants (to help prevent the formation of clots) has been proven to be a very effective treatment. In fact, anticoagulation is crucial in the prevention of strokes in AF patients over the age of 60. Radio-frequency ablation (RFA), a new technique for treating recurrent atrial fibrillation, uses radio-frequency waves to destroy abnormal electrical pathways in heart tissue. This approach has shown some promise for cases of AF that have been unresponsive to conventional treatments. In some cases, surgery is also a treatment option. Dr. Maghaydah, who is board certified in cardiovascular disease and a Fellow of the American College of Cardiology, is a member of the medical staff at Cayuga Medical Center. He is in practice with Dr. Jonathan Mauser at Cayuga Cardiology, where he can be reached at (607) 269-0100. Dr. Maghaydah is interested in general cardiovascular disease management and has additional training in cardiac catheterization, transesophageal echocardiography (TEE), and nuclear cardiology.